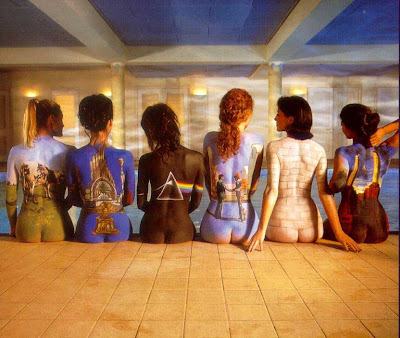 Anything said about Pink Floyd falls short for words to express what their music does to you ! Journeying the sub-conscious self through space and time, creating images in the mind never seen before. Leading you slowly into a state of trance with mind expanding guitar playing laced with some hypnotic tunes on the keyboard by Richard Wright, Roger Waters ( Originally George Roger Waters ) & David Gilmour cast a magical spell on you with their intriguing voice and intense words from a different world ! Nick Mason does a stellar job on the drums maintaining the cohesion in sound Pink Floyd so wonderfully created together. 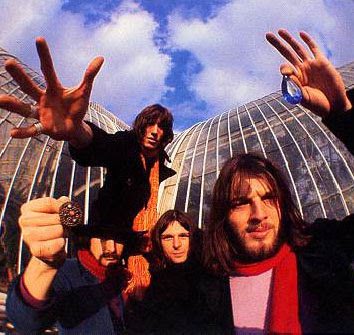 While most Floydians believe their style to be Psychedelic, some also call it 'Space Music' . Their music transcends all genre classifications as they are truly the Masters of Psychedelia. They were called The Meggadeaths, The T-Set (Tea Set) , Sigma 6, The Screaming Abdabs and then the Architectural Abdabs before they called themselves The Pink Floyd Sound which eventually became the legendary, PINK FLOYD. 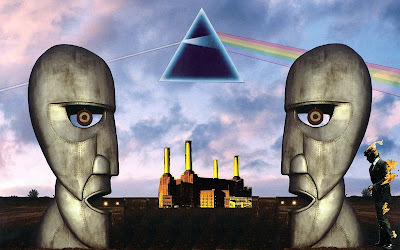 The name Pink Floyd comes from 2 famous Blues musicians from Georgia, Pink Anderson and Floyd Council. Roger Syd Barrett (R.I.P) who was one of the founding members of the band got a lil' too spaced out in his adventures on LSD and lost his place in the band to a long time friend David Gilmour, so began the magic of Pink Floyd. The Dark Side of the moon has sold over 35 million copies in the world making it the 3rd largest selling album after Meatloaf's Bat out of Hell and the monster album of all time, Thriller by Michael Jackson. Dark Side of the Moon marks the first time in Pink Floyd’s career when bassist Roger Waters wrote all of the album’s lyrics. "The concept was originally about the pressures of modern life - travel, money and so on," drummer Nick Mason says, "but then Roger turned it into a meditation on insanity." In a mental asylum under a prescribed dosage of psychedelics (then called drugs), Roger Waters was writing the words to Rock History's biggest album ever. Time, Money and Brain Damage are my favorite milestones on this journey to the dark side of the Moon ! Some also draw an uncanny similarity between the old classic The Wizard of Oz and The Dark Side of the Moon. When played in synchronous and by using a specific formula for playing both simultaneously, the audio-visual effect is rumored to create temporary insanity and a sort of malfunction in the thought process ! The next best seller by Floyd is The Wall, which is based on Roger's life also made into a movie later on with the help of friend, Alan Parker. Another excellent theme based album which creates a story as each song progresses. Another Brick in the Wall 2 was one of the most talked about songs of the 80's and still sounds as provocative and rebellious as it did then, questioning Educational ethics and the social system indirectly. The next big one from Floyd is Wish you were Here, creating super psychedelic mental imagery paying tribute to Syd Barrett who at that time was living in anonymity somewhere in London. The Relics (Compilation), Atom Heart Mother and A Saucerful of Secrets. The Meddle in particular was a classic from Pink Floyd released in 1967. One of these days, Fearless and Echoes are masterpieces in their own right. Animals too was a good release, with classics like Sheep, Dogs and Pigs on the wing. The Final Cut was the last release which saw Roger Waters' name under the Pink Floyd flag following the ongoing ego clashes and constant disagreements with David Gilmour. Roger Waters and the Pink Floyd were the highlight of major drama, for Roger had copywrited most of the Floyd work under his name. For one, Pink Floyd couldn't have the huge inflated pig at their live shows since Roger objected to it. So they went on and inflated a pig with Balls to prove a point ! Retrospective : The Making of Pink Floyd's "The Wall"
I would somehow disagree with your rating of The Wall as one of Pink Floyd's top works. Agreed - it had huge mass appeal, but it was nowhere compared to WYWH, DSOTM or Final Cut in terms of lyrical quality and neither does it touch the virtuoso musical quality of Animals, The Division Bell and DSOTM again. It didn't even have the brave experimental strains that were a hallmark of Ummagumma and DSOTM. All in all, The Wall was nothing more than a mediocre piece of music backed by some awesome PR. Hi Narcissist ! To rate any of Floyd's albums as best would undermine all the other equally magical music they've made ! I was simply talking in terms of the sales the albums have generated ... and The Dark Side of the Moon is their largest selling album till date ! Roger Waters did not write Dark Side of the Moon while taking psychedelics in an institution. Where did they hear this crap? The LP could well have been called Dark Syd of the Moon, because it was really about Syd's mental breakdown.